There are referral links in this post. 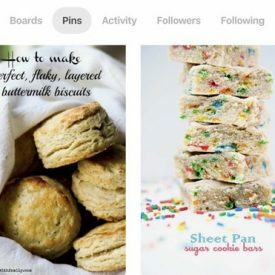 I recently found an app that’s changed my blogging life. I know that’s a huge statement to make right? 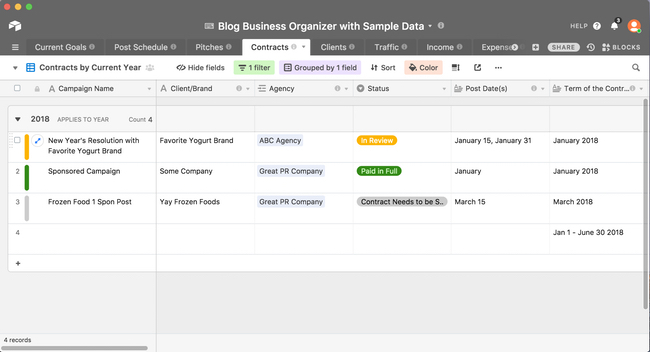 But for a long time, I have been looking for a tool where I can track different aspects of my business. I had google sheets documents, I sometimes used a calendar or a plugin and then I also had Excel spreadsheets. Recently, I found an app called Airtable and I signed up for a free trial. A few days later, I started playing with it. And I got really excited! Let me rewind, I was a software engineer for ten years and used to build databases with SQL code. And then I would build visual and web representations of the data. It was actually fun for me. So when I opened up Airtable and could build a database (Airtable calls them bases) really quickly, I MEAN really quickly! 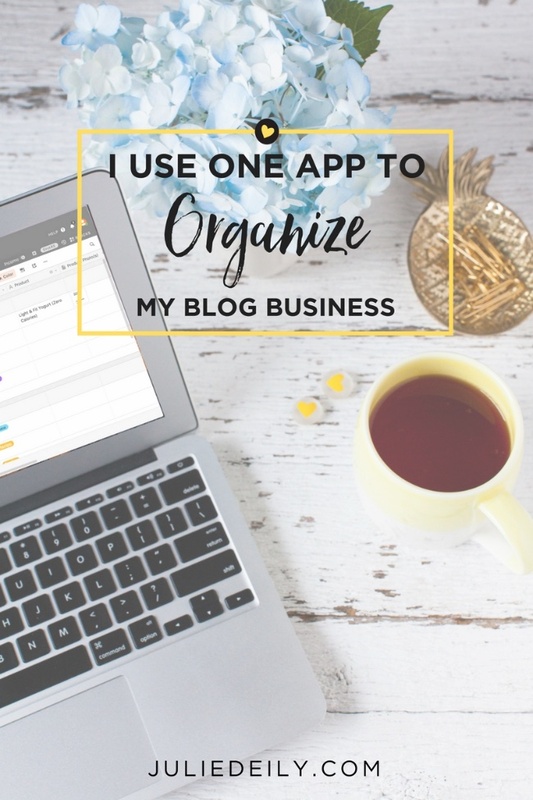 In one afternoon, I had the beginnings of what I call the Blog Business Organizer now. I started using it and quickly realized how much it was helping me. I started by entering in my contracts for 2018 and could quickly see where my schedule was filling up with sponsored posts and see where I didn’t have much scheduled. I also quickly saw what I was already slated to make for 2018 and saw how it stacked up to my income goal for the year. I was constantly searching my email for the information I needed to start on a project. I was weeding through threads that are sometimes 50 to 60 emails deep to find the answer to a question I had, what I needed to include, what I needed to photograph or what product I needed to buy for my project or the next phase of my project. Is that you too? My friend, Meseidy, said it best when she told me she was using her email as a giant filing cabinet and it wasn’t working for her. Same here! And it’s definitely not working for me either! Now I don’t have to search my emails. 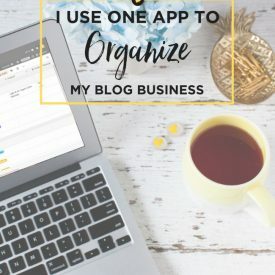 Because I’m consistently putting the information into my Blog Business Organizer as I’m receiving emails and as I’m on phone calls with clients. In the video below, I show you five reasons why I love Airtable! I can change field types and options very quickly. 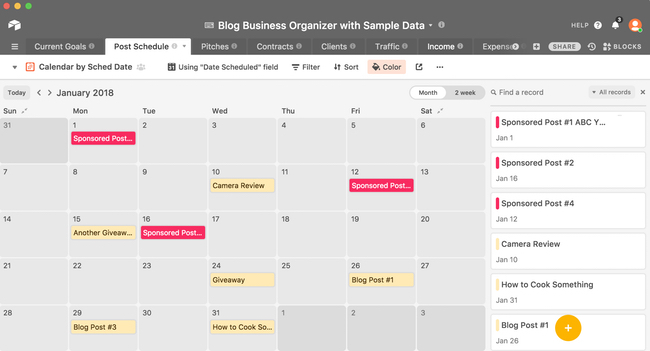 If you have a date field in your table, you can view the table as a calendar. The calendar is drag and drop! There is an attachments field type which means you can drag and drop files and images directly into your table! What else have I used Airtable for? 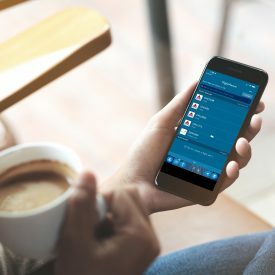 Are you interested in trying Airtable out? Sign up for an account today! Next, sign up for my free video course! I show you how I use Airtable to keep track of my sponsored contracts! Over the course of three days, I'll email you one lesson a day with a short video to show you how I organize my sponsored contracts and stay on top of my business. You will see how easy it is to manage your business! You will feel less stress, feel more confident and get stuff done! 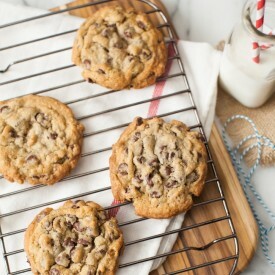 *You are signing up to receive email from JulieDeily.com. You will receive an email with the first lesson tomorrow. We won't spam you and we won't sell your information. 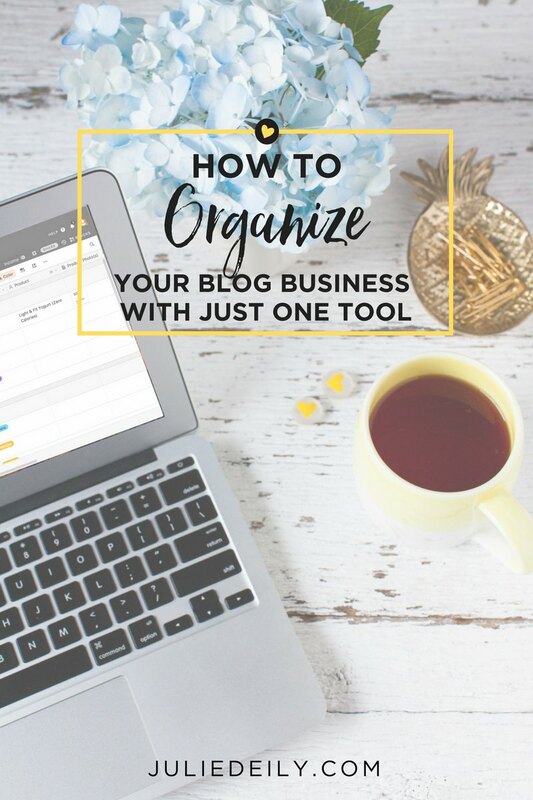 If you’re interested in checking out the Blog Business Organizer, it’s available NOW and it’s on sale (but just for a week only)! Check it out here. Disclosure: This is not a sponsored post. Airtable doesn’t know who I am! There are referral links in this post. You’re my online organization hero! Thank you so much for sharing this Julie! Very helpful.